The UK government has stressed its opposition to the death penalty in support of an appeal by Briton Lindsay Sandiford against her death sentence in Bali for drug trafficking. The British consulate in Bali submitted a statement to the appeal by Sandiford, 56, from Gloucestershire. The UK Foreign Office also said it had raised allegations of her mistreatment. Sandiford claims she was coerced into smuggling 4.8kg (10.6lb) of cocaine, for which she was convicted last month. 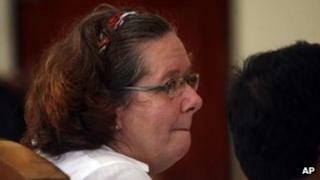 She faces death by firing squad following the Bali court's verdict on 22 January. A UK Foreign and Commonwealth Office (FCO) spokesman said the so-called amicus brief had been submitted to Denpasar High Court, on the island, as part of Sandiford's appeal. "It continues to be the longstanding policy of the United Kingdom to oppose the death penalty in all circumstances and we will do all we can to assist British nationals facing the death penalty," he said. He added that allegations of mistreatment of Sandiford had been raised with the Indonesian Ministry of Foreign Affairs. "We do not comment on legal matters as this may prejudice an individual's case," he said. "We take allegations of mistreatment extremely seriously and if any British national alleges mistreatment, we will, with their permission, raise it with the appropriate authorities." At the end of last month, Sandiford lost a legal bid in the UK to get the British government to fund a lawyer for her appeal in Bali. It had been said that she was urgently in need of funding to pay for an "an adequate lawyer" because her family had exhausted all of their available resources. The UK government's opposition to the death penalty meant it had a legal duty to ensure Sandiford was able to appeal against such a sentence, her legal team in the UK argued. But the Foreign Office's policy of not providing legal representation to British nationals overseas was backed by High Court judges. Sandiford is originally from Redcar in Teesside but her last UK address was in Gloucestershire. She was arrested after a flight from Bangkok, Thailand, in May 2012, and accused of being at the centre of a drugs ring involving three other Britons. She has repeatedly denied she was attempting to sell drugs in Bali, insisting that she had been coerced into carrying by gangsters who were threatening to hurt one of her children. One of the Britons, Julian Ponder, 43, from Brighton, was jailed for six years after being cleared of smuggling but convicted of possessing 23g of cocaine.